Maybe it’s was my failure ahead of the start of the season, in terms of player selection, strategy and formation, looking approximately 8 weeks ahead, but planning for just 4 weeks. 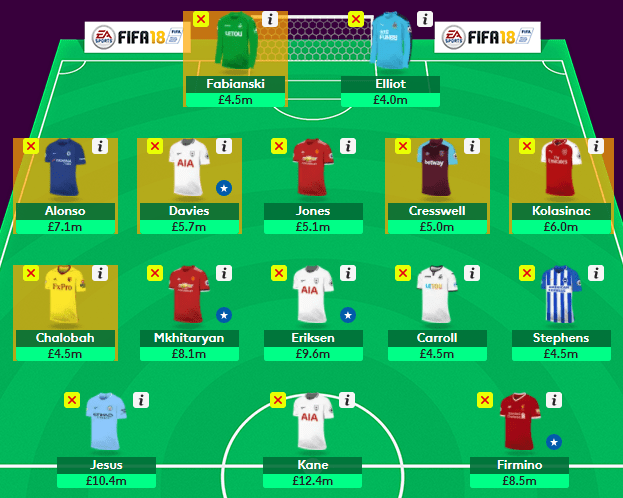 Like many other FPL managers, I went through many different drafts, chopping and changing players, shifting budget from defense to attack, settling on a big midfield, while going without a premium forward. Risky? Yes, very much so, but felt there was more value to be had in the middle of the pitch than up top, while interspersing a few premiums in my defense. It’s wild card weekend for me, as I hit the activation button midweek to bring about my second and last wild card on the season. Too soon? Possibly, but even with 2 FT headed into GW23, I felt change was necessary. My squad didn’t perform as well as I had expected, however GW22 was strong, even if I missed the deadline for the start of the fixtures. No, I wasn’t hungover either. A bit less than 24 hours ago, as of this writing I made the decision to activate my second wild card for this FPL season. While considered “early” I did hold it 2 weeks longer this year, than I did last year. Won’t do much good as we await the teams for the BGWs and DGWs, but was looking a bit shorter terms and teams that could help secure differential points and possibly provide a bump in the overall rankings. It’s hump day as we stare down towards the weekend and GW23. I have listened to a few podcasts but haven’t come to any decisions. Last Thursday I was thinking of activating my second wild card (read Ways of the Wild Card) after seeing a few on Twitter take the plunge. By Tuesday, I was convinced my 2 FTs were enough to make necessary changes to improve my squad thus holding the WC until a later date or should I? The last 2 seasons I have burned my wild card early, after the first international break. While I did see an immediate return last year, the end result was devastating, recording red arrows the next 15 of 20 game weeks. By GW27, when the bleed stopped and I turned my season around, it was too late. I was unable to recover from a 1.5m overall ranking and salvage an acceptable season. However, it was a learning experience and I would like to believe the perseverance paid off and has made me a better manager moving forward. This season I have made it a week further than I have the last 2 years as I now contemplate activating the first of two wildcards. Before GW1, the plan was to hold the transfer until after the second international break. I believe fantasy managers must remain flexible to all conditions and factors as we plan our strategies. For me, I currently have a plan in place through GW11. I don’t expect to hold true to the plan, but it gives me an idea as to what I would like to do. On the drive into work today I caught the tail end of the FFScoutCast Ep 232, which I had started yesterday. As expected, the banter was top shelf with Mark continuing to get a rubbing from Granville, using his wild card on some questionable players. Take a listen if you haven’t. What caught my interest was some comments from AZ regarding, considering going 5 defenders instead of spending on budget midfielders who aren’t producing. Names he brought up; Alonso, Kolasinac, Davies and Mendy. This comment has me reconsidering moving the wild card up and playing it this week to bring in more wing back options in to further my attack. While So’ton still have strong fixtures, their fantasy assets are a mess. I’ve been lucky in 2 weeks to get the triple CS from Bertrand, Cedric and Yoshida. While I haven’t been disappointed with Valencia (3 CS), his attacking returns haven’t really materialized to date. Last week Jones was brought in for the injured Kompany, but his tenure may be short lived. So just what I am considering? It seems all the rage is being able to go big up front with 3 premium priced forwards. This is how it feels, as fantasy managers attempt to get a combination of Kane, Lukaku, Aguero, Jesus, Morata, Lacazette, Morata and Firmino up front, while remaining strong in the midfield, but knowing you will run budget midfielders who need to start, as well as budget defenders, potentially in a rotational capacity. Starting the season with Kane, Jesus and Firmino, I feel confident these forwards will return on a regular basis. These three forward account for £31.3m. Based on my starting two midfielders, many will say I lack a potent attack with Eriksen and Mkhitaryan starting in my 5-2-3. However both are healthy and both have started the season very well. The other three midfielders (Carroll, Stephens, Chalobah) are starters, but I don’t plan on using them if injury should occur. The activation of the wild card will be tailored to my defensive needs, as this is where I have allocated nearly £29.0m! While the So’ton treble has been rewarding and their fixtures appear worthwhile, it’s time to move away and provide more attacking opportunities. Current defensive set up feature So’ton and Man United, but So’ton has the better fixtures moving forward, as they play each other at Old Trafford in GW6. The addition of Wesley Hoedt and resigning of Virgil Van Dijk adds a question mark on the playing time of Yoshida, while Bertrand and Cedric should continue to be nailed on as starters. Yet, the Saints offensive threat has been terrible through 4 weeks. Conversely, United have scored 12 goals, while conceding 2 goals, but Valencia has failed to see attacking returns. With their fixtures getting a bit challenging, it’s time to look elsewhere. If I do activate my wild card ahead of GW5, it will be focus around upgrading the defenders to wing backs. Alonso and Kolasinac were in my pre-season plans, but both were left out of the 15-man squad for GW1. Davies has been the hottest commodity defensively since Alonso’s brace in GW2 but priced much more favorably at £5.7m. Kolasinac would be brought in for his attacking prowess and possibly a few clean sheets if they can get their starting XI squared away. The final 2 spots could be a number of offensive players; Maguire, Jones, Cresswell, Dawson, McAuley, Cedric, Daniels. My plans will include Cresswell, as fixtures turn for West Ham, as I retain Jones for at least 2 more weeks before I look to move him for someone like Maguire. Thoughts on this newly revised 5-2-3 formation? I feel it takes advantage of the strong forwards, as well as strong defenders, while being able to fit in a few premium options in the midfield. While I can’t own all those high priced players, this feels right. Remember when you were a kid and you had $5 burning a hole in your pocket? That’s how I’m feeling, continuing to hold my wild card after many were activated last weekend. Looking forward, the tentative plan is to activate for GW6, but that could be postponed. Currently, I am just 22 (204 vs 226) points off where I was this point last season, but 600k lower in the overall rankings. Unlike last year, I don’t feel an urgency to make massive changes. There are some players, looking ahead that I want to move, while a few others are on my watch list to make the 15-man squad. The 5-2-3 (#5mandefence) formation has been solid this season, so no complaints about not having a 4th or 5th midfielder or a consistent third forward. While I do need to address my defense, it’s not all that urgent. Maya Yoshida relegated to bench could bring the “So’ton 3” to an end. While they have returned a CS in just two of the first four fixtures, it was a risk I was willing to take. I might even keep three So’ton defenders through GW11, their fixtures are THAT good. Now if they could only score a goal. Yoshida could lose his place in my starting XI this week, as the FT will go towards replacing him. With the signing of Hoedt and Van Dijk, making an appearance with the U-23’s, his days and those of Jack Stephens could be numbered. Who do we replace him with? Currently I have £1.9m ITB and a squad value of £100.2 (£0.2m lower than where I expected to be). There is just a short list of replacements for Yoshida. Marcos Alonso had been heading that list (2 goals/1 assist, 1 CS) for a few weeks, Chelsea’s fixtures are improving but still have ARS/MCI/MNU/liv through GW18. Ben Davies has matched Alonso with two, 14 point returns on the back of 1 goal, 2 assists and 2 CS. A staggering £1.4m difference in price and better immediate fixtures could mean holding Alonso for just a bit longer. The problem with Spurs has been playing at Wembley Stadium, where they have conceded 1 goal in each of their home matches, while remaining perfect on the road with 2 clean sheets. Facing the likes of SWA and BOU at home should provide great CS potential. Away, HUD is ranked 15th, while WHU is ranked 20th in attack based on Sqwaka statistics. Could be a great time to invest in Spurs defense! So the short term is resolved, Yoshida out, Davies in, which now gives me Kane/Eriksen/Davies as the treble moves from So’ton to Spurs, to go along with Man United. Based on the team comparison above, I will be tempted to bring in Alonso after GW7 against MCI. I don’t believe you can discount So’ton at this point. Outside of GW6, home against Man United, their schedule is still very favorable; cry/MUN/stk/NEW/WBA/bha/BUR. Not sure if Newcastle is for real or not, but they have 2 CS in their last 2 fixtures with good looking run forthcoming, only LIV to challenge in GW7. Unless I feel a need to change formation, I have no problems with my 5 attackers. The 2-man midfield of Eriksen and Mkhitaryan have been solid, so has the play of Firmino, Jesus and Kane up front. Although, 3 blanks by Kane to start the season has been tough to swallow, he’s now just 2 goals back of Lukaku. I would like to add Eden Hazard to my starting XI, but I believe it could come at a cost of either Eriksen or Jesus. Right now, I am not keen on moving either player. A change in formation would also necessitate the addition of a third premium midfielder. Consideration has been made moving forward to move to a 4-4-3. But realistically with no glaring problems, I have an issues changing from my 5-2-3.